New England Classic factory finishes make it even easier to install perfect wood paneling every time. 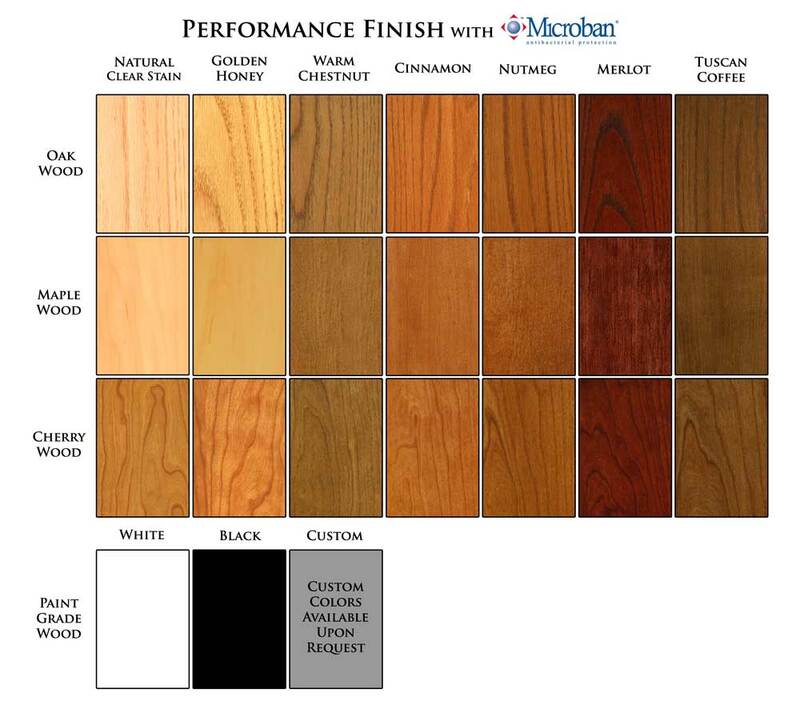 You can choose from several stain finish colors for New England Classic wall panels and components. Or, for an up-charge, we will match any color stain you desire. We also offer a white painted finish. Factory finished panels and components speed installation time, making New England Classic an even more cost-effective solution, and at the same time, producing a superior end product that will bring the warmth and beauty of real wood panels to any home or office. All of our factory Performance Finishes are infused with Microban© to keep your product fresh longer, and for longevity. Note: Colors may be not be rendered accurately due to varying monitors, their position as well as system settings. We will send a wood color sample chip after your order for approval confirmation before staining begins if you like. Since wood veneer is a natural material, normal variations in wood grain and character marks may accept stain differently, resulting in natural color and fill variations. It is these variations that contribute to a wood species' natural beauty and warmth. Our stain color chart, finishes chart are good representations, but every monitor shows colors differently and this is a representation of our stain color offerings. Fill all nail holes and splices with matching stainable wood filler. Avoid getting filler on the surface around the hole. Sand wood filler patches smooth to the veneer surface with 180-grit paper, taking care not to sand through the veneer. Apply stain, sealer and clear finish coat, lightly sanding between coats with 220-grit paper. We recommend applying a light coat of lemon oil or furniture oil to replenish the natural sheen, especially in dry environments. use of wax polish may cause buildup and dull the finish sheen. Prior to installation, prime any surface to be painted that is not factory-primed, then sand with 180-grit paper. (NOTE: DO NOT SAND BEADBOARD PANELS!) It is not necessary to prime stiles, rails, shoe, cap or casing. After installation, apply one coat of paint to panels, than after it dries thoroughly sand with 220-grit paper. DO NOT SAND STILES, RAILS, SHOE, CAP or CASING and DO NOT SAND BEADBOARD PANELS.